According to reports that have gone viral on social media, women’s health is under attack, again, but perhaps not for reasons you may think. Researchers in Buenos Aires, Argentina, found that 85% of all cotton derived feminine care products from tampons to sanitary pads, contain a chemical linked to a wide range of health problems, including infertility and cancer – Glyphosate. If you are not familiar with Glyphosate, you should be, as it is widely prevalent in our food supply, thanks to its creator, Monsanto. If Monsanto doesn’t ring a bell, their most popular and widely used product is the herbicide Roundup®. Glyphosate is the main ingredient in Roundup. They are also behind GE (genetically engineered) crops resistant to Roundup, also known as Roundup Ready. Seeing the smattering of articles on this subject really hit a chord with me for two reasons. One, I recently attended a class at the 26th Annual American Herbalists Guild Symposium on how GMOs (genetically modified organisms), Glyphosate and Roundup, affect human health. Let’s just say that class was frightening and heart-breaking. Two, around a year ago, I wrote an article on how Roundup affects hormonal balance, so I know this potent herbicide’s harmful effects. My two passions in life are working with plants and women’s health. So now, with this latest information on Glyphosate contamination in feminine care products, it feels like a direct attack on the work I do. Our most widely produced crops – soy, cotton, sugar beets and corn are genetically altered with Glyphosate to be “Roundup Ready”, so that when they are sprayed with Roundup, they don’t die. In the case of cotton production, when the bud opens the crop is sprayed with Roundup, condensing the Glyphosate and ending up in the finished products. Not only was Glyphosate found in tampons and sanitary pads, it was found in sterilized cotton balls and gauze pads used for personal hygiene and medical care. What About Organic Cotton – Is it GMO Free? This is a great question and brings up a very important point. 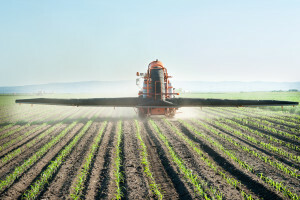 GMO crops can cross-pollinate with organic crops, making them susceptible to GM contamination. BUT, that being said, organic farmers work extremely hard to maintain an organic product; they don’t spray their crops with harmful herbicides, pesticides or chemical fertilizers. Glyphosate isn’t the only thing we have to worry about in these products, as they also contain the by-product of the commonly practiced chlorine bleaching process of cotton products – dioxin. Dioxin is also a known carcinogen and estrogen disruptor. In addition, Roundup contains other harmful chemicals such as POEA (polyethoxylated tallow amine) and AMPA (aminomethylphosphonic acid), which have been shown to be detrimental to health as well. Both POEA and AMPA have been shown to affect cellular health by damaging the plasma membrane and poisoning the mitochondria. The mitochondria contained within each and every cell is the “energy” of the cell. What’s a Lady to Do? The delicate vaginal tissues are also one of the most absorbent. Each time you use a cotton tampon or pad, you may be absorbing these harmful toxins, close to your reproductive organs, areas that contain an innumerable amount of hormonal receptor sites and your eggs. I don’t know about you, but I really don’t want these toxins next to my lady parts. That is why I moved away from using conventional feminine care products years ago. I use reusable organic cotton pads made by Glad Rags or the menstrual cup, Mooncup, made of soft medical grade silicone. It is latex-free, hypoallergenic and contains no dyes, BPA, phthalates, plastic, bleaches or toxins. Other options are disposable certified organic cotton feminine care products made by NatraCare or Seventh Generation. The best way to protect yourself from harmful toxins in your tampons and menstrual pads is to choose healthy alternatives. Don’t forget, you are not only exposed to Glyphosate through your feminine care products, but through your cotton clothes and most importantly, the foods you eat. Do your part for your health and the health of future generations by choosing to eat organic and non-GMO foods whenever possible. Also, adopt organic yard-care and agriculture processes. Your choices impact your health and the health of every living species on the planet. We are all in this together.